Plantar fasciitis is a debilitating and often difficult injury to shake for distance runners. Symptoms can often remain for months and in some cases years. I personally have been dealing with this injury for 12 months. As any committed runner I have thrown more money than I would like to admit at this injury and along the way have found some things that work and something’s that don’t. Recently I came across the Zamst HA-1 Running sock, it claims to reduce the stress on the planter fascia during activity by providing support through a unique knitting pattern. Initially I was very sceptical but at this stage after 12 months I am willing to give anything a go. Zamst is well-known in the team sports arena for injury management and rehabilitation products. Their range mostly consists of various knee, elbow, shoulder, back and ankle braces. The brand was born in 1993 off the back of the successful Japanese orthopaedics company, NIPPON SIGMAX leveraging off their medical expertise to produce functional brace support products for athletes. The design objective of the HA 1 Sock is to provide heal stability and lift up the arch of the foot. This is achieved by using a stiffer less elastic fabric and knitting pattern under the arch of the foot and across the ankles (designated by the grey fabric in the pictures). The socks are also made to be anatomically correct meaning there is a specific left and right sock. The rest of the sock fabric outside of the grey stability section is an open weave technology to aid in ‘breathability’ and moisture management. Initially these socks are quite stiff to get on due to the rigid stitching under the arch. Just walking around I could definitely feel the difference compared to bare feet in the arch stability. The stability offered is not as effective as taping but to be honest being a pull on sock I wasn’t expecting it to be anyway. I noticed that while the actual stability properties may not be as good as taping the more rigid knitting under the arch actually helped to remind my foot not to roll in and as such I felt my intrinsic foot muscles working more to stabilise my own arch. I have done a number of runs in these socks in addition to wearing them to work during the day. I have noticed the difference in stability and arch roll when compared to standard socks however the severity of my personal injury still requires taping in addition to the use of the socks during runs. Moisture management wise these socks perform well and wick moisture away from the skin to a level I would expect of any good running sock, in addition the open weave technology has kept my feet cool during running. I haven’t had these socks long enough to really test their durability but initial results look promising as the density of the stability fabric and stitching patterns used appear to be rather durable. The stitching pattern combined with the fabric offers users of these socks a medium stability function but more importantly a physical cue/reminder to their feet to remain in the neutral position. I don’t believe these socks are the sole (pun intended) answer to plantar fascia injuries but I do believe those with mild cases or previous history of the injury will find benefit. 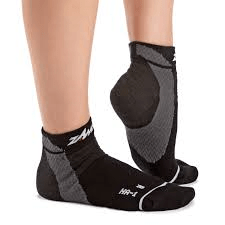 In my personal opinion these socks are best used in the early onset of plantar fascia injuries or when the condition is mild and a place to start before moving to more intrusive methods such as taping and orthotics.